We are offering a large range of Party DJ Services. We provide DJ Sound service to all over Delhi NCR. Our range start from Rs. 9999/- only. It includes full sound systems for banquet hall and open area. We are providing the service of DJ Shows. 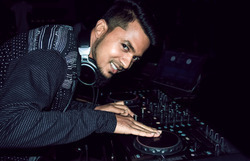 DJ for Events , DJ in gurgaon, Dj in Gurugram, Dj in Delhi, Dj in Noida, Dj in Faridabad, Dj in UP, Dj in punjab, Dj in south delhi, Dj in Kolkata, Best dj in delhi. Dj for Party , Dj for New year party, Dj for New year celebration, Dj for concert, Dj for Marriage, Top Dj providing services in India. Captivating on the skills of our professionals, we are involved in rendering DJ Show Event Management. DJ show with led video wall & dance group setup. 3S Advertising is one of the best DJ and Event management companies in PUNE. We are proud to offer exceptional DJ services and plan and manage events for Corporate Event, Promotional Activities, Product Launch, Parties etc. We are fully equipped with professional Sound systems, mixing consoles, CD Players and unlimited collection of CD's.